Small Business Saturday is coming up this Saturday, November 28th, and my city puts on a fantastic event downtown that I am always excited about–The Mod Shop: Indie Crafters Market! The stores downtown open their spaces for local artists and artisans to sell their artwork and wares. Here is some history from the local paper. This year, my sister and sister-in-law will be joining forces to sell cup cozies and purses. Last year, my friend Angela sold stationary (she doesn’t sell anymore, otherwise, I’d post the link to her Etsy shop). Last year and again this year, fellow librarian–and now published poet–Stella Beratlis and our town’s former poet laureate Gillian Wegener will be typing up poems on the spot. The event always reminds me of a great fundraiser the Friends of the Los Banos (public) Library put on every October–the Small Works of Art Sale. Here is an article about this year’s event from Los Banos’ local paper. Since I began working in Los Banos as the town’s college librarian, I help sell tickets and man tables during the event to show my support. Essentially, the Library closes a little early, so local artists and artisans can show off and sell art and wares, the proceeds of which go to the Friends. There is also wine and delicious goodies. Tickets are just $20 a piece. It’s so great to see members of the community all come together to hang out, buy art, and support their local library. This year, I manned a table of succulents in handcrafted chic concrete pots and some modern wall hangings by United by Form. These were the only wares and artworks not created by someone local, but the artist is a friend of the daughter of one of the Friends’ members. I have a profound love for succulents, so I bought a couple for myself. What kind of fundraisers does your library’s Friends’ group do? The Friends of the Los Banos Library also do a Used Book Sale every fall and spring, which I know are popular among many public library Friends’ groups. Is a small works of art sale something you think would work well for your local Friends? Let me know if your Friends’ group decides to put one on. This isn’t a library post, but we librarians sure love our communities—the ones we work with and the ones we live in. My husband and I are very big proponent of giving our finances and time. For both college and graduate school, I received scholarships from donors, so I give to both my alma maters, California State University Stanislaus (I also work here part-time) and San José State University, and I also give to the community college I work for, Merced College. I don’t talk about this much, but we also give to our church, Crossroads Church, so that we can help carry out the work to assist people in need. We also give to the Modesto Gospel Mission, a local homeless shelter, and to Second Harvest Foodbank of San Joaquin and Stanislaus Counties. And if my bio says NPR listener, you bet I give to Capital Public Radio. We also do various one-time donations for issues that come up throughout the year. Regarding the refugee situation, I wanted to highlight World Relief Modesto, another organization we donate to. World Relief helps resettle refugees that are placed in Modesto. My first encounter with World Relief was actually seeing them in action in the community when I was working part-time at my local library, Stanislaus County Library. A World Relief volunteer was showing an Ethiopian man the public library. I was so impacted that I, at one point, applied for a job with World Relief. I didn’t get the job, mostly because they knew how much I loved libraries. I really believe in the work they do. If you can give to a similar organization in your area, please do! What causes, charities, or other groups do you donate your time or finances to? What issues are close to your heart? Besides libraries, of course. 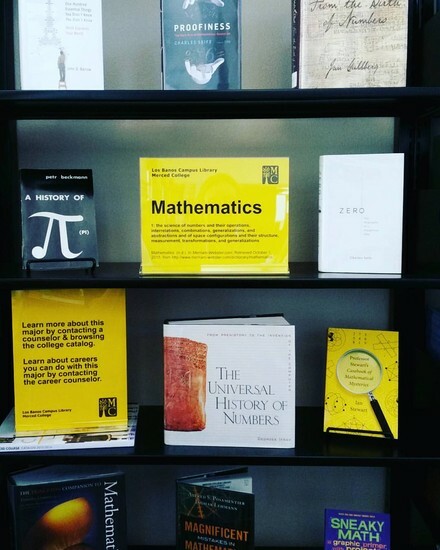 In October, I had two Major Idea displays (see the August 2015 Library Displays post to learn more about what this is), one about math and another about English, which focused on fairy tales as a theme to explore literature studies. October 15th was also the end of Hispanic Heritage Month. 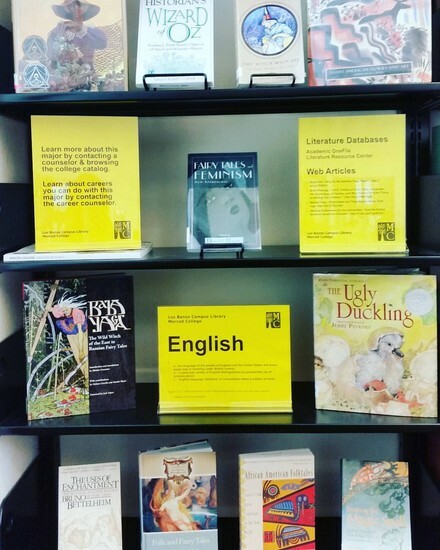 See the September 2015 Library Displays post about it here.. 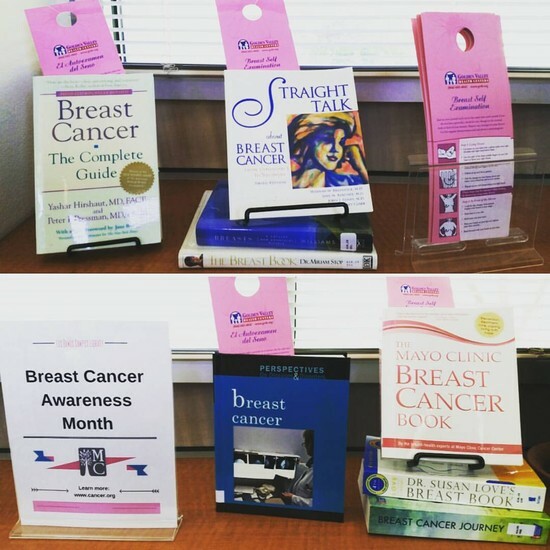 I also put together a quick display for Breast Cancer Awareness Month, which included directions for conducting a breast self-exam in both English and Spanish. I snagged up the instructions during an event our campus had last year that had booths from the community, including the local health center. 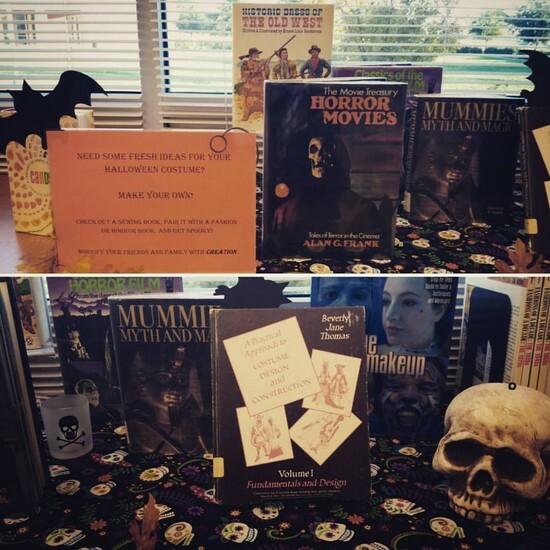 One of our part-time evening librarians put together our Halloween display this year, for which I am very grateful. Here’s the online flyer I made for her display. Since I have more people to rely on in the library and now know what can be delegated, it’s been fun to see others’ creativity. October is always the beginning of research paper season around here, so it’s been busy! I’ll have to share more about that soon.